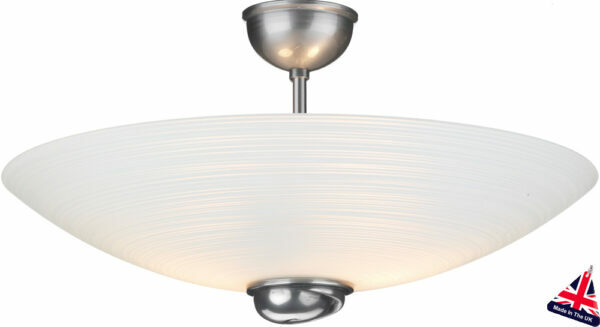 Stunning semi flush fitting white swirl Art Deco style glass uplighter. Made and hand finished in the UK. Pewter finish ceiling plate, with a central drop rod holding a 400 mm glass uplighter dish that diffuses the light from the two lamps. The glass is a particular feature, with white swirls on opaque glass and a large pewter finish central finial beneath the support rod. A wonderful Art Deco style semi flush uplighter that will bounce the light off the ceiling and create a focal point in any room. The lamps are totally hidden from view making it perfect for use with low energy spiral lamps. The low 200 mm height makes this light fitting ideal for rooms with limited ceiling height.